How Do Teams Benefit From Team Confidence? Winning hockey clubs exhibit “team confidence.” Team confidence includes: trusting in the abilities of teammates, believing in your own abilities, having well defined roles, and adopting a style of team play that focuses on your strengths. A hockey team who plays as a confident team gains an advantage by playing in the moment, focusing on the process and taking control over the flow of the game. The Buffalo Sabres are struggling to find their confidence as a team for the 2013-14 season. The Sabres are off to a slow start and, currently, have the worst record in their division, 1-8-1. The Sabres last made the playoffs since the 2011 and have been playing very tentatively so far this year. Ryan Miller, starting goaltender for the Sabres, has noticed his team’s hesitant play, “We need a little bit of confidence. We have a good group of guys that can move the puck. I think we’re just a little bit timid. We’re waiting for something good to kind of happen…” Teams that lack confidence wait for good things to happen instead of making good things happen. Teams that lack confidence are reactionary, playing back on their heels and being a step behind their opponents. Miller recognizes the key components needed for team confidence, “We need to control the puck a little more, and these guys have the skill to do it. They’re going to start stepping up. It just takes a little bit of confidence, a little bit of time, and I think we can start seeing some improvements there. It’s definitely something we can do.” Hockey teams do well when they control the puck, thus dictating the flow of the game. Players must believe in their abilities and the skills of their teammates. Confident hockey teams trust in their skill sets and their game plan, which allows the team to commit to a winning style of play. Teams gain confidence when they focus on the process. Hockey players gain a sense of control when they focus on the process, what they can do in the present moment instead of worrying about the future or fretting about past loses or mistakes. Playing with confidence is all about overcoming the fear of what could happen in the future. You can increase your confidence by focusing on the process (what you can do now), knowing your strengths (what are your assets), and playing to your strengths (create a game plan that highlights your strengths). You can be a confident athlete and a member of a confident hockey team with the commitment and hard work. 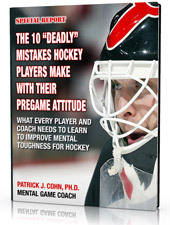 Sign Up For a Free Hockey Mental Game eBook!